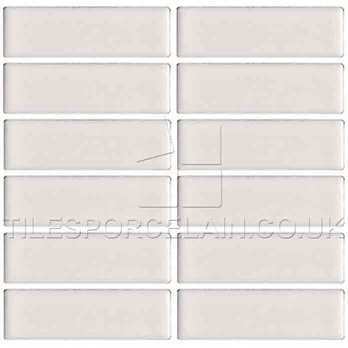 These Ceramic tiles have an elegant look comprising of a rectangle mosaic design and plain cream colour. This stylish and classy look is emphasised by a highly polished finish. The neutrality of these tiles will enable you to combine them with both light and dark colours as part of stunning bathroom and kitchen decors – where they can be used as a splash back feature above worktops or as a general wall application. The intricacy of the mosaic design and fresh cream colour makes these tiles a chic, modern and contemporary option for interiors. These tiles have a sleek and smooth surface which makes them easy to clean and maintain. Furthermore, these premium quality ceramic tiles are hard wearing and durable.